Delight your family by preparing this classic American breakfast that they’ll love. You can mix other fresh fruits with kiwifruit and add all sorts of dried fruit and nuts. Mix the flour and baking powder in a bowl and make a well in the middle. In another bowl, beat the egg with the milk, sugar, yogurt and melted butter (75 g). Pour this into the dry ingredients and stir with a whisk. Grease a large non-stick frying pan, heat it and pour in 2 or 3 pancakes of around 6 to 7 cm. Let them cook for a minute, flip them over and cook for a minute more. Remove and serve on individual plates. Repeat for the rest of the mixture. 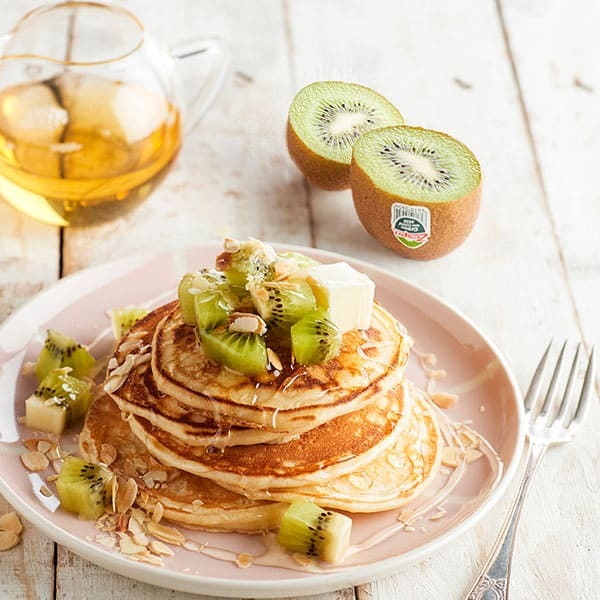 Serve hot with a dash of butter and syrup, the Zespri kiwifruit cut into cubes or slices and the almond flakes.